The RSAA library and archive have their origins in the collections of the founders of the Central Asian Society, as it then was, in 1901. Originally intended as a resource for its own members, the RSAA collections are now accessible to anyone with a serious interest. The archives are frequently cited by both academic and non-academic researchers. The RSAA collections are focussed on the period after 1800, although they include a small number of items from earlier centuries. Reflecting the Society’s origins, the collections are strongest on Central Asia, but include material relating to the whole of the continent. Our catalogue was completely overhauled in 2018 and can now be consulted online by any member of the public without restriction. The RSAA library is housed on two sites: at Haileybury school near Hertford; and at the RSAA office. The catalogue indicates at which location any particular book will be found. There are reading rooms in both places. It is essential to make arrangements in advance of a visit to either location. Books held at Haileybury can, with sufficient notice, be made available at the London office.The Archive can only be consulted in London. The RSAA office is open on weekdays 09:30-16:30. To plan a visit to the London office or to Haileybury, call 020 7235 5122 or email info@rsaa.org.uk. 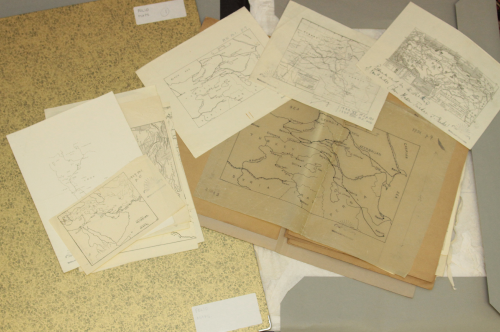 The Society’s archive includes a significant number of maps and postcards as well as original correspondence, paintings, sketches and other artifacts. The Society’s Archivist, Dr Rosie Llewellyn-Jones, will be happy to advise researchers who want assistance in locating particular material.